The Golden State Warriors are an American professional basketball team based in Oakland, California. They are a member of the Pacific Division of the Western Conference in the National Basketball Association (NBA). 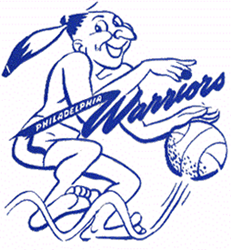 The team was established in 1946 as the Philadelphia Warriors based in Philadelphia, Pennsylvania, a founding member of the Basketball Association of America (BAA), and it won the inaugural 1947 BAA Finals that is now considered the first NBA Championship. In 1962, the franchise relocated to the Bay Area and was renamed as the San Francisco Warriors until 1971, when it changed its geographic moniker to Golden State, California's state nickname. Since 1972, the team's home court has been Oracle Arena in Oakland. Led by early scoring sensation Joe Fulks, the team won the championship in the league's inaugural 1946–47 season by defeating the Chicago Stags, four games to one. The NBA, which was created by a 1949 merger, officially recognizes that as its own first championship. Gottlieb bought the team in 1951. In 1962, Franklin Mieuli purchased the majority shares of the team and relocated the franchise to the San Francisco Bay Area, renaming them the San Francisco Warriors. 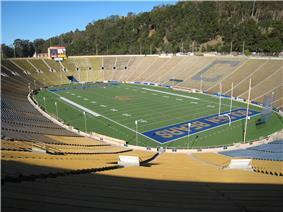 The Warriors played most of their home games at the Cow Palace in Daly City (the facility lies just south of the San Francisco city limits) from 1962–64 and the San Francisco Civic Auditorium from 1964–66, though occasionally playing home games in nearby cities such as Oakland and San Jose. 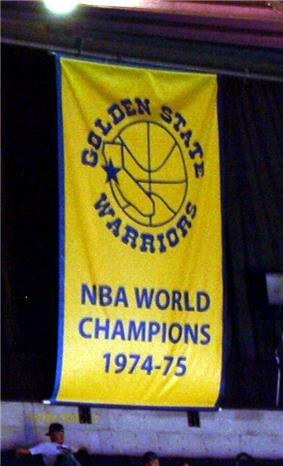 The Warriors' 1974-75 championship banner. The franchise adopted its brand name Golden State Warriors prior to the 1971–72 season, in order to suggest that the team represented the entire state of California. Almost all home games were played in Oakland that season; six were played in San Diego, but none in San Francisco or Daly City. Oakland Arena became the team's exclusive home court in 1972. The Warriors made the playoffs from 1971 to 1977 except in 1974, and won their first NBA championship on the West Coast in 1974–75. In what many consider the biggest upset in NBA history, Golden State not only defeated the heavily favored Washington Bullets but humiliated them in a four-game sweep. 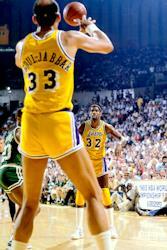 That team was coached by former Warrior Al Attles, and led on the court by Rick Barry, Jamaal Wilkes and Phil Smith. Barry was named MVP of the finals. Because of the loss of key players such as Barry, Wilkes and Thurmond to trades and retirements, the Warriors struggled to put a competitive team on the court from 1978 to 1987 after being one of the NBA's dominant teams in the 1960s and most of the 1970s. Through the NBA draft, however, they acquired some players such as high-scoring forward Eric "Sleepy" Floyd, and journeyman forward Mickey Johnson. (Floyd once scored 29 points for the Warriors in the fourth quarter of a playoff game against the Lakers, though he was later traded to the Houston Rockets). The departure of these players for various reasons symbolized the franchise's futility during this period, as head coach Attles moved up to the front office as general manager in 1980 and the team made several coaching changes. New owners Jim Fitzgerald and Dan Finane finally managed to return the team to respectability by hiring former St. John's small forward Chris Mullin in the 1985 NBA draft. A ticket for a 1988-89 game between the Warriors and the Jazz. The Warriors faced early difficulties in their attempt to return to the playoffs. Richardson was traded to the Charlotte Bobcats for rookie Brandan Wright. To make things even worse, Jackson was suspended for seven games over a firearm incident. They opened the 2007-08 season with six straight losses, but Ellis' rise, Davis' solid injury-free season (21.6 points, 8 assists, 4.6 rebounds per game), and an overall improvement in team chemistry brought them back to playoff contention; but in the end the Warriors were eliminated from the 2008 Western Conference Playoffs despite a 48–34 season, which is the best record in NBA history for a non-playoff team since the NBA playoffs had expanded to eight teams per conference. The Warriors sold out nearly every home game during the season averaging 19,631 per game, the highest in team history. The Warriors had another injury-prone year in 2009-10. as they were consistently unable to field their ideal starting lineup. In November, a malcontented Stephen Jackson and seldom-used Acie Law were traded to the Charlotte Bobcats for Raja Bell (out for the season with an injury) and Vladimir Radmanovic. Four days later, they signed center Chris Hunter. Starting in January 2010, they issued multiple 10-day contracts, most notably to power forward Anthony Tolliver from the Idaho Stampede. Due to their multiple injuries, they were granted an exception allowing them to sign Reggie Williams from the Sioux Falls Skyforce to a 10-day contract on March 2, making it their fifth D-League call-up that season, tying an NBA record. They eventually waived the injured Bell to sign Williams for the rest of the year, and finished the season 26–56, fourth in the Pacific Division. On June 24, the Warriors selected Ekpe Udoh, a power forward from Baylor, as the 6th pick of the 2010 NBA draft. 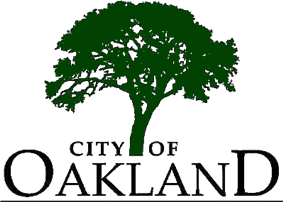 They also introduced a modernized version of their "The City" logo depicting the new eastern span of the San Francisco-Oakland Bay Bridge, and switched to a simplified color scheme of royal blue and gold. They also introduced new uniforms reminiscent of the 1969-71 "The City" uniforms. The Warriors made an offseason trade that sent Turiaf, Randolph and Kelenna Azubuike to the New York Knicks in return for star high-scoring power forward David Lee via a sign-and-trade. Lee agreed to a six-year, $80 million deal, on a framework contingent on the decision of superstar forward LeBron James to leave the Cleveland Cavaliers to sign with the Miami Heat that same day. Following Morrow's departure after he signed the New Jersey Nets' offer sheet, the Warriors signed Dorell Wright, formerly with the Miami Heat, to a three-year, $11 million deal. The Warriors gathered together during the team's starting lineup ceremony prior to their 2011-12 exhibition opener against the Sacramento Kings. The Warriors continued their signing spree by adding Harvard guard Jeremy Lin to their roster with a one-year partially guaranteed contract containing a second-year team option, the first Chinese-American player in NBA history. Louis Amundson was then added for little under $5 million in mid-September. Keith Smart was hired as head coach that same month after Nelson had resigned before the start of training camp. The Warriors ended the season 51–31, winning more than 50 games for only the fourth time in franchise history, finishing 20 games over .500 for the first time in 22 years, and tying the 1991-92 squad for the franchise's all-time mark of 24 wins on the road. Even without Bogut, in the first round of the playoffs the Warriors battled the third-seed Los Angeles Clippers to a seventh and deciding game, which the Warriors lost, bringing their 2013-14 season to an end. It was season of many thrilling moments in which the Warriors' played in 17 regular-season games decided by 2 points or less, 6 games with winning shots in the final 3 seconds, and 7 comeback wins in which the Warriors had been behind by 15 points or more. In other noteworthy occurrences for the season, Curry was named to the starting lineup for the 2014 NBA All-Star Game. For Curry, the only Warrior named to the team, this was his first all-star appearance in five seasons as an NBA player. Curry hit another notable milestone in posting 4 triple-doubles for the season, tying a franchise record unequaled since Wilt Chamberlain in 1963-64. Curry also averaged career-bests in points and assists; averaging 24.0 points and 8.5 assists in the season. Curry and Klay Thompson continued to set league records in three-point shooting. On February 7, in a 102–87 win over the Chicago Bulls, the backcourt duo became the first teammates to each make a three-pointer in 30 consecutive games. Curry, who finished the season with 261 threes, set an individual record for most three-pointers in a span of two seasons with 533, surpassing the previous mark of 478 set by Seattle Supersonic Ray Allen in 2004-05 and 2005–06. Together, Thompson and Curry combined for 484 threes on the year, besting by one the NBA record they had set the year before. Even as the team rolled towards the post-season, signs emerged of trouble in the Warriors' front office. On March 25, the team reassigned assistant coach Brian Scalabrine to the team's NBA Development League Affiliate in Santa Cruz because of what head coach Mark Jackson called a "difference in philosophies" and what unnamed league sources cited by Yahoo Sports called "an increasingly dysfunctional atmosphere" on the Warriors' coaching staff. Fewer than two weeks later, assistant coach Darren Erman was fired for secretly recording conversations between coaches, staff and players. During the post season, rumors persisted in the press that Mark Jackson's job as head coach was in jeopardy, leading the players to make a unanimous declaration of support for Jackson's return only minutes after the Warriors' first-round, game seven playoff loss to the Clippers. Nonetheless, three days later, on May 6, the team announced the firing of Mark Jackson as head coach. In his three-season tenure as head coach, Jackson compiled a 121-109 (.526) record, overseeing a terrific turnaround. When Jackson took the helm in 2011, the franchise had made the playoffs only one time over the prior 17 seasons, averaging 30.2 wins per season during that period. Jackson, 49, became just the third head coach in franchise history to lead a team to at least 50 wins in a season, joining Don Nelson and Alvin Attles, who both hit the mark twice with the Warriors. With 121 wins overall, Jackson ranks fourth on the franchise’s all-time wins list, trailing Attles (557), Nelson (422) and Eddie Gottlieb (263). On May 14, 2014, the Golden State Warriors named Steve Kerr the team's head coach in a reported $25 million deal over five years. It is a first-time head-coaching position for Kerr, 48, a five-time NBA champion point guard who holds the all-time career record for accuracy in three-point shooting (.454). Kerr formerly served as president and general manager for the Phoenix Suns basketball team (2007 to 2010), and had most recently been working as an NBA broadcast analyst for Turner Network Television (TNT). In the 2014–15 season, the Warriors finished with an NBA-best record of 67–15, the most wins in franchise history. The Warriors also finished with a home record of 39–2, the second best in NBA history. They were first in defensive efficiency for the season and second in offensive efficiency, barely missing the mark that the Julius Erving led Sixers achieved by being first in both offensive and defensive efficiency. On May 4, Stephen Curry was named the 2014–15 NBA Most Valuable Player, the first Warrior since Wilt Chamberlain to do so. In the first round of the playoffs, they swept the New Orleans Pelicans in the first round, then defeated Memphis Grizzlies in the second round and defeated Houston Rockets in the Western Conference Finals. The Warriors advanced to their first NBA Finals since 1975, where they defeated the Cleveland Cavaliers in six games to win the NBA Championship and end their 40-year championship drought. Andre Iguodala was named Finals MVP. In April 2014, the Warriors began the purchase process for a 12-acre site in Mission Bay, San Francisco, to hold a new 18,000-seat arena which they hope to have ready for the 2018–19 NBA season, with construction to begin in early 2016. The sale was finalized in October 2015 The location was selected after an original proposal to construct the arena on Piers 30 and 32, just south of the Bay Bridge, met with vocal opposition due to concerns about traffic, environmental impacts and obstruction of views. The new location, which still faces some vocal opposition in San Francisco, apparently eliminates the need for any voter approval, which would have been required with the original site. Some type of waterfront park is planned across from the projected arena, which will be located at an already-existing Muni T-Third stop. The Central Subway, planned to open in 2018, may provide a direct connection between the new site and the downtown Powell Street Muni/BART station. The Golden State Warriors, along with this move, may consider a name change, possibly returning to their former name of San Francisco Warriors. The name change will get input from fans before it becomes official. Bob Fitzgerald has done television play-by-play, and former Warrior guard Jim Barnett has done color commentary for the Warriors for over 15 years, currently on Comcast SportsNet Bay Area, where they telecast more than 70 Warrior games a year. They also host Roundtable Live, a half-hour pre-game show leading up to the broadcast of select Golden State home games. Fitzgerald is in his 16th season as the Warriors' play-by-play man, while Barnett is in his 27th season as color man. Greg Papa and Garry St. Jean are the third and fourth members of the telecast team, specializing in in-game, halftime and post-game analysis, while Rosalyn Gold-Onwude serves as the sideline reporter. Tim Roye has done the radio play-by-play for Warrior games since 1995. He is joined in the booth by former Warriors forward Tom Tolbert for home games only. All games are broadcast on KNBR, 680 AM. After each game, Roye, Fitzgerald and Barnett get together for post-game radio analysis and a next-game preview. The team trains at Oakland Convention Center, Oakland, California. They also train at the Marriott Hotel. 4 Also general manager from 2004–09. ^ Philadelphia was 1947 league championship finalist – and won the inaugural 1947 BAA Finals – not as Eastern champion but as winner of the runners-up bracket. The Eastern and Western champions met in one best-of-seven semifinal series while four runners-up played best-of-three series to determine the other league finalist. The Warriors were second in the East, won the runners-up bracket, and defeated the Western champion Chicago. Next year the Baltimore Bullets won the runners-up bracket and defeated the Eastern champion Warriors in the 1948 BAA Finals.